Ever wonder if gemstones have healing properties? When you wear a piece of jewelry made with gemstones, you are literally tapping into the healing life force energy of our planet and universe. Each gem offers it’s unique healing properties to you. They clear blocks and bring fresh life force energy to the parts of you that have become stagnant. Gemstones charge up your field and protect you from unwanted energies. Each stone is made up of a blend of elements that gives a unique vibration, a distinctive color, and specific healing property. For this reason, it is good to have a clear intention for your healing and choose the right gems that will support you best. Here are some of my favorite gemstones to work with and wear. What color is it? Shades of red to brown, also pink, green and orange. What are the healing properties? A powerfully energizing and regenerative stone. Enhances one’s creative drive. It is a stone of health. Removes the negative energies preventing you from forward movement and transmutes them into a beneficial state. Grounding stone. When I am asked to create a necklace for someone who has been through a hard time, I go with garnets. They are good stones to bring a sense of courage and peace. There is an ease and letting go of painful emotions. My Sacred Mary necklaces feature garnets often. What are the healing properties? 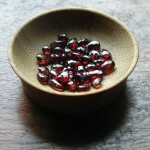 Carnelian creates stability, grounding, centering. It gives courage, promotes positive life choices, eases sluggishness and motivates us to success. Helps you to trust yourself and your gut. Eases feelings of envy, fear and anger. Reminds us to be in the moment. Carnelian is one of my favorite stones to wear personally. 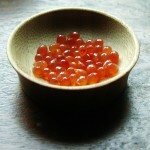 I love the orange color, and it’s a cheerful stone that brings an energy of vitality. If you need to feel protected and grounded where you’re going, this is your stone. When someone asks me to suggest a good stone for helping to make choices and decisions, this is the one I recommend. What color is it? The color ranges from yellow to golden brown. What are the healing properties? It is a stone of manifestation, helping manifest abundance in many ways. Promotes a sense of of inner calm and allows your natural wisdom to emerge. Helps you to be in the flow of your feelings and stay in balance. Relieves depression, self-doubt, anger, and irrational mood swings. I keep several large citrine crystals in my healing room. They generate happiness and cheer and are excellent at dissipating negative energy. 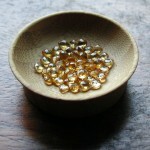 Citrine is self cleansing and won’t absorb negative energies. My favorite every day earrings are the citrine little gem earrings. Which chakra it is helpful for? Thefourth chakra, but really, it’s calming, cooling energy is good for all chakras. What are the healing properties? 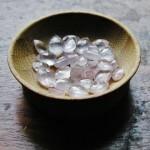 Rose quartz builds self-confidence and opens the heart to receive love. 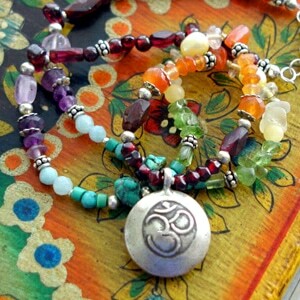 It gently cleanses negative energies while calling in a loving, peaceful vibe. It is helpful in releasing heartache and grief. Strengthens the ability to accept change. Softens, eases, and makes us more gentle. I include a little rose quartz in most pieces I create- it is such a good heart opener, and it has a very high vibration which helps to keep your whole energy field charged and protected from negativity. It has such a pretty soft pink color. Which chakra is it helpful for? Thethird and the fourth chakra. What are the healing properties? Peridot releases toxins on all levels. It purifies your subtle energy and physical body, as well as your mind. It is a great “old baggage” clearer! If you struggle with feeling burdened by guilt, this is your stone. Helps you to detach from the opinions of other people and instead trust and follow your own gut. 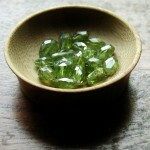 Peridot is the stone I usually recommend to people who have a hard time slowing down and enjoying life. This stone helps you delight in the little things. Generates a feeling of joyfulness and contentment. When I am not wearing my favorite citrine little gem earrings, I am wearing the green tara peridot earrings. What are the healing properties? 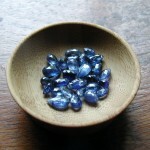 Kyanite is excellent for spiritual attunement and meditation. It is a powerful amplifier of high frequency energy and it stimulates intuitive abilities. It vibes a constant energy of compassion. It encourages us to speak our truth. Cuts through fear and removes blockages or obstacles to healing. I love this blue stone. I buy a little more of it every chance I get. It does not hold negativity, it does not build up energies at all which means it never requires cleaning. If you are needing a boost in your meditation practice or your intuitive skills, try wearing kyanite. What color is it? Light to dark purple. What are the healing properties? 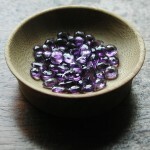 Amethyst has a purifying energy. It encourages spiritual wisdom and selflessness. It calms the mind and invigorates you. It aids in meditation helping you stay grounded while you contact the higher energies. There is a sense of deep peace with this stone. It also guards against psychic attack and negative energies. This is the stone to wear if you feel you need protection and stability in your life. Amethyst is a great stone to wear every day. It gives a subtle charge to your energy field and protects you from energies in stressful or challenging environments. It is good at helping you “just let it go” when things get tense. I keep several large amethyst crystals in my meditation space-it keeps the room clear and transforms the energy. So there you have it, my favorite gemstones of all. Hope this shines a little light about the healing properties of gemstones. Having the right intention and knowing which gemstones will support you best is a must so that you can keep yourself feeling 100% fabulous.